Looking for a boat trailer? Read this before you buy! In the market for a new boat trailer? You’ll want to get familiar with what boat trailers are available before you buy. From size to weight, not forgetting price, here is the low down on boat trailers! All of these great designs are available from Almac Trailers – your go-to business for marine accessories in Bundaberg, Australia. Boat trailers come in a range of styles to suit every boat and vehicle. If you choose the wrong type of trailer for your boat, there’s a chance you could risk your safety. Boat trailers have been known to break if fitted incorrectly, and that’s something you want to avoid. Safety should be at the front of your mind when choosing your next boat trailer. Who wants a bulky boat trailer that is both heavy and difficult to use? Cumbersome boat trailers can really spoil a great day on the water. You want to ensure loading your boat, towing, launching and retrieving your tinny is a quick and easy process. What’s more, when manoeuvring your boat, you want to be sure all the gear inside your boat will remain intact. The right size trailer, selected with your equipment in mind, is essential! Here at Almac Trailers, our boat trailers are the right size and weigh less than 40 kg, making them ideal for your needs. If you’ve got an aluminium boat, around 3.5 to 3.8 metres in length, a folding boat trailer may be the right one for you. 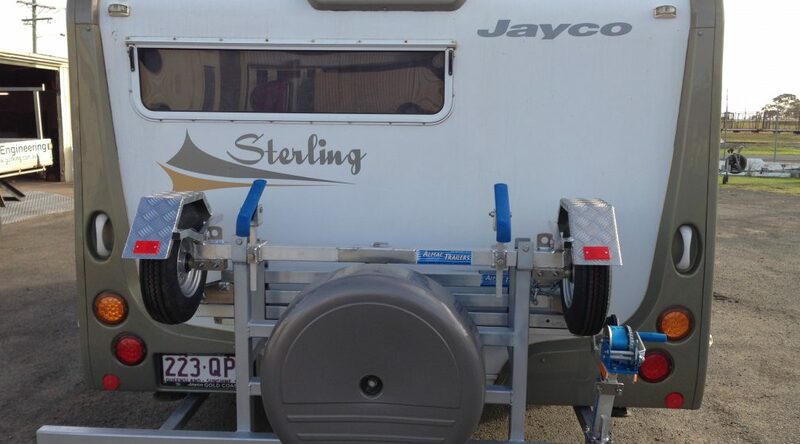 This type of trailer is mostly used to work with tinnies, transported on your car or 4WD. Folding boat trailers are true trail blazers – lightweight and convenient so you don’t waste time you’d rather be spending fishing. Our folding trailers have the ability to be packed away to a size convenient for storage. You can unhook your trailer from your vehicle, fold it up and store it away in a few minutes. The assembly process of our quality folding boat trailer is just 4 minutes! Made with marine grade aluminium and stainless steel fittings, folding boat trailers are extremely durable. They withstand salt water without corrosion and are very strong considering their weight of just under 40kg. All Almac Trailers folding trailers can be towed at speeds of 100km per hour and are road registrable. Heading away for the weekend? Our single folding aluminium boat trailers can be folded down to a mere 2.1 metres in length, making it ideal for long runs in a caravan or camper trailer. Your trailer will fit nicely across the back of your Caravan. These trailers are ideal for long-range travellers with limited storage space. Impressed by single fold trailers folding down to 2.1m? You’ll be even more excited by our double folding boat trailers, which pack down to just 1.5 metres in length! Double folding boat trailers can easily be stored inside your vehicle, on the roof rack or inside the caravan. The versatility and space efficient design make these trailers ideal for tourers and caravanners. Always check the specs for weight limits and full assembly details but choose one of these innovative trailers and you’ll be hitting the water in no time! Due to the nature of Almac’s products, it is no surprise these folding boat trailers are in demand. With their ability to fold down to a tiny size, coupled with their lightweight design, durability and strength, Almac’s trailers won’t disappoint. Ready to buy? You can purchase your folding boat trailers online. Alternatively, contact Almac Trailers today for a chat about the best boat trailer for your needs. Need great advice about the best boat trailers for your needs? Talk to the experts at Almac Trailers today – and get out on the water tomorrow!